(From Sigma lens literature) The Sigma Corporation is pleased to announce the new APO 200-500mm F2.8 / 400-1000mm F5.6 EX DG Lens. An ultra telephoto zoom lens offering a fast aperture of F2.8 at the 500mm focal length and F5.6 at the 1000mm. The dedicated "Attachment" ensures autofocusing at the 1000mm focal length. This ultra telephoto zoom lens offers a fast aperture of F2.8 at the 500mm focal length and F5.6 at the 1000mm. It covers widely used focal lengths from 200mm to 500mm and has a large aperture of F2.8 throughout the entire zoom range. This lens can be used to create amazing image expression with various types of photography such as astrophotography, portraits, wildlife, sports. SLD (Special Low Dispersion) glass and three ELD (Extraordinary Low Dispersion) glass elements provide excellent correction for all type of aberrations. The super multi-layer coating reduces flare and ghosting and provides high image quality from the extremely large aperture. The lens hood, designed exclusively for this lens, blocks out extraneous light. A 72mm filter can be inserted at the rear of the lens, and a circular polarizing filter can be used thanks to the ingenious internal rotation mechanism. The dedicated Li-ion battery BP-21 is used to power the zooming and AF operation. This battery is built in the lens barrel. For the convenience of the photographer, focusing distances and focal lengths can be viewed on the lens' built-in LCD panel. 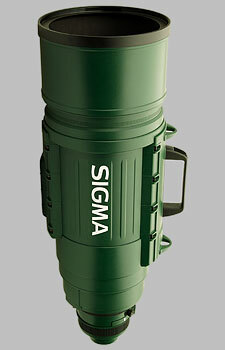 The Sigma 200-500mm f/2.8 EX DG APO doesn't have any user reviews yet!